If you're a crystal / stone enthusiast and use these tools for healing or psychic connection, then you know the importance of finding those pieces that create a nexus with you. An effective combination of your energy and the mineral's frequency is vital. So...instead of listing multitudes of descriptions and metaphysical properties, I've decided to concentrate on specific minerals that I have found to be exceptionally useful. Like I stated previously, I suggest novices to crystals / stones read up on the subject...then decide what direction you wish to travel. Most crystals / stones that are preferred for psychic connection and energy work are also popular for personal renewal and Reiki healing. 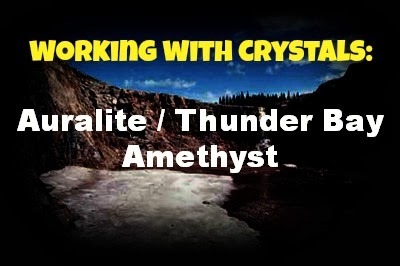 Several years ago, a new mineral compound from the Thunder Bay region of Ontario, Canada started to hit the market. The first pieces offered for sale were described as the 'New Super Seven' and branded as 'Genesis.' Most of these beautiful violet, gel white and red-capped pieces had an elestial form and a variety of striations ('recordkeeper'), somewhat similar to Lemurian Quartz. I was immediately drawn to these crystals, so I found a connection who had a few exceptional pieces for purchase. After I opened the first shipment, I instantly merged with a few of the specimens. I have employed these pieces in my work ever since that day. These crystals are currently dubbed Auralite, Auralite 23, Thunder Bay Amethyst, Red Amethyst, Canadian Red Cap, Kindred Spirit Stone, 24 Genesis and Super 23. There are a few variations, but for the most part, it is basically an Amethyst with these inclusions: Titanite, Cacoxenite, Lepidocrosite, Ajoite, Hematite (which gives Auralite its red coloring), Magnetite, Pyrite, Goethite, Pyrolusite, Gold, Silver, Platinum, Nickel, Copper, Iron, Limonite, Sphalerite, Covellite, Chalcopyrite, Gialite, Epidote, Bornite and Rutile. 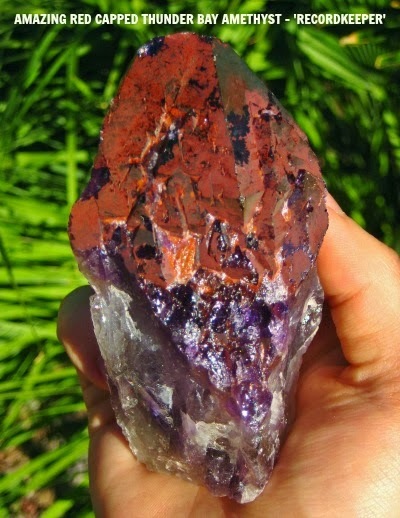 It is said that Auralite contains upward of 23 elements, but many contain at least seventeen. Because of the different inclusion minerals, the vibration will vary per piece.